The Book Chook: Read to Kids! Do you need yet another good reason to read to your kids? Don't just do it for your children. Do it for your country! 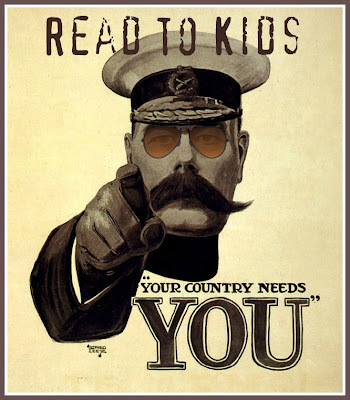 If you love reading, and want to remind people how important it is to read to their kids, you're welcome to use my poster. I made it by adding text via Picnik to the classic Lord Kitchener public domain poster found at wikipedia. Oh, yes, and I added a pair of sunglasses too! Adding captions to images to generate a poster is a fun literacy activity you might like to try with your children. Find more ideas in my post, Book Chook Favourites - Making Posters. What a great poster and message! Someday I'll try something creative like that. I'm struggling to keep up with editing family pictures and getting a few in photo albums. Thanks for the nice comment on my bookmarks for World Read Aloud Day post. I've been busy lately and haven't been checking in on my favorite blogs. I'm taking some time tonight to read some of your posts. Your blog is definately one of my favorites. @Michelle I am always amazed how busy moms like you find time for all the great stuff you do online, Michelle. Thrilled to think The Book Chook is a favourite!